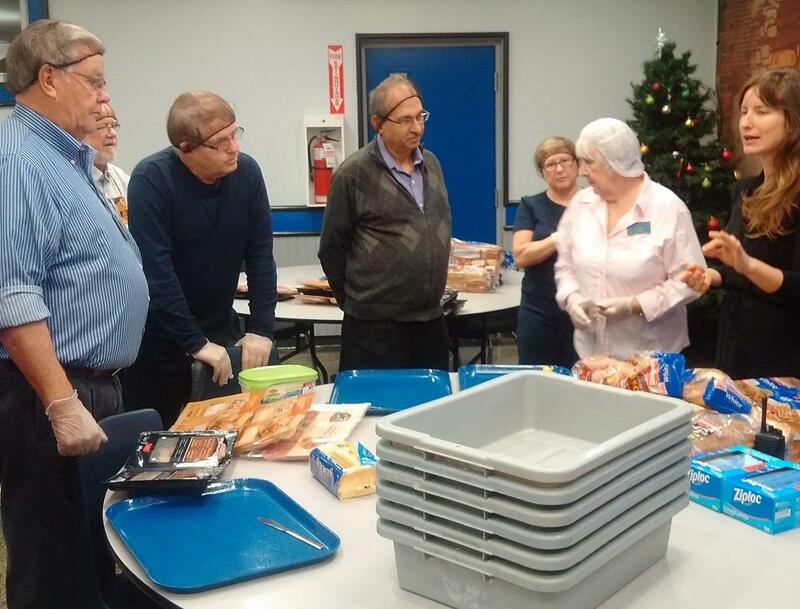 RCOS members helped out at the Ottawa Mission by making sandwiches. The Mission is a very well organized and important service in our city. From their website: The Mission provides not only food, clothing, and shelter, but a wide variety of innovative life-changing programs that help people regain their dignity and provide hope for a better future. These programs include addiction treatment, education and job training, employment and housing services, medical and dental care, and hospice care. The kitchen was buzzing with staff and volunteers, but was spotless despite all the work being done. With great direction, and tips on how to make a sandwich, we were ready to get started... after we put on our hair nets! Part of our support was providing all of the supplies to make the sandwiches, thank you to Dawn and Joan for picking up and bringing them. Ham, salami, roast beef and turkey on both white and whole wheat bread. There were plenty of left-overs which we left the Mission. We made well over 200 sandwiches, the Mission often goes through over 300 per day. The sandwiches are not the main meal, they are used for people who need to take a meal to work, snacks between meals or after the kitchen is closed. We worked in two teams and set up an effective assembly-line system which certainly revolutionalized sandwich making. Peter Tilley, Executive Director of the Ottawa Mission, popped by and thanked us for our help. We had a lot of fun and the Mission staff we met were very welcoming. Thanks to Dawn Cooper, Sam Monsour, Joan Hunter, Gary Pluim, Julia Ginley, Makc MacGregor, Monique Warrack, Ian Warrack and Scott Vetter.